Drum roll, clarion-call, and deep breath in readiness for the ooohs and aaahs of delight that will follow …..
We are very proud and excited to reveal our 2020 cover image!! Ta da!! Fabulous artist Anne Thomas is responsible for this exquisite image named 'Spiral of Life'. 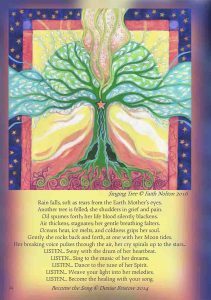 She is an Earth Pathways Diary regular contributor and we are so honoured to feature her work on the fronts of our products next year. To quote from her website 'Anne is both Mother and Grandmother. 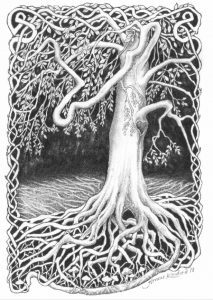 Her artwork reflects something of the deep primal connection with 'The Source' that witnessing new life can bring. Knowing Love, being part of the driving fertility of Planet Earth; the miracle of existence, the vivid colour, vitality, recycling and regeneration - and behind it all, within the centre of things, a stillness and belonging. She often includes species of wildlife native to the UK in her designs, celebrating the lives of these blessed beings, calling us to notice, respect and learn from them'. How perfect! 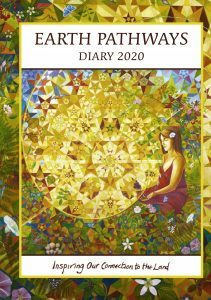 Many thanks to all of you who reserved your 2020 diary & calendar through our Early Bird scheme. No surprises to learn that they have all been snapped up quickly! If you would like to hear about special offers and other useful information, or you just want to keep up to date with the cycle of Earth Festivals, then sign up to receive our regular e-newsletters. We thought it was time for a refresh so you'll notice some changes here. We are adding more images and vibrancy to many pages so please be patient while we update your favourite bits!